I hear from readers often who are worried about the possible repercussions of downloading music and movies from file-sharing sites or P2P services such as LimeWire and Bittorrent. Now there's something new to worry about for users of P2P search services such as TorrentSpy... can you get sued for searching? 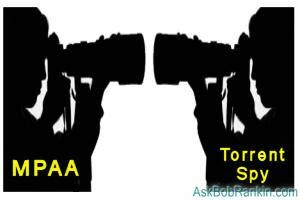 The MPAA (Motion Picture Association of America) is filing suit against the popular TorrentSpy website, a search engine that helps people find and download movies. Even though TorrentSpy does not host or distribute files, the MPAA contends that they are violating copyright law just by helping people find links to pirated movies. If the MPAA prevails in court, TorrentSpy will be forced to turn over the IP addresses (and perhaps search keywords) of their users. Armed with that info, the MPAA could contact a user's Internet service provider, and ask them to provide contact information for the user. So YES... it seems that simply using a P2P search site such as TorrentSpy can put you in the crosshairs of the MPAA, and open the door to legal action against you. If the MPAA succeeds in forcing TorrentSpy to turn over their user information, you can bet the the RIAA (Recording Industry Association of America) and other copyright watchdogs will begin to go after other search sites that provide users with links to illegal and/or copyrighted materials. TorrentSpy this week cut off service to users in the USA, rather than give up the data, but it's not clear what the court will decide. ...I can't see how TorrentSpy can be accused of copyright violation if they're not involved in the hosting, serving or distribution of files. All they do is help people find the files they're looking for, in the same way that Google helps users find websites. But one must acknowledge that TorrentSpy would not exist were it not for the hordes of Internet users searching for pirated copies of music, movies and television shows. I'm sure they have a FEW legitimate users who are looking for a public domain copy of some old cowboy movie, but their business model is clearly built on helping people who want to illegaly download copyrighted materials. Maybe they deserve to be punished for that, but I hope they are not forced to turn over their user logs, as that would set a dangerous privacy precedent, adversely affecting the majority of Internet users who rely on Google, Yahoo and other search engines to find online information. The legal wrangling between TorrentSpy and the MPAA has gotten ugly. This week, it was revealed that the MPAA paid $15,000 to an ex-TorrentSpy employee who hacked into the TorrentSpy email servers, and provided MPAA with copies of emails sent by TorrentSpy executives. It's hard for me to find the "good guys" in this squabble, but one thing is clear... your Internet activities are not as private as you may have thought. Most recent comments on "Sued for Searching?" I was under the impression that even if the movie, game or music was not in the public domain, it was still considered legal and legitimate if you already owned a copy of said exact product. That being the case, TorrentSpy has no control over how uses the site, or what results can be returned. They can't even be blamed for including non public domain items, as some people DO have a good reason for going. EDITOR'S NOTE: It's a common misconception that one can legally download a copyrighted song/movie if (1) they don't sell it or make any money from it, OR (2) they already own the song/movie on a CD or DVD. Sorry, but it's just not true. It may seem ethically correct in some situations (for example, your CD got scratched) but it's still not legal. Unlike you, I am a lawyer. Have been for a very long time. So, let's say that someone offers to help members of the public find old friends. No problem there, I suppose. But do you think it might be a problem if the service's advertising is targeted at people trying to locate old friends who are now in the Federal Witness Protection Program? While it may not always be the case, intentionally helping someone do something illegal is usually illegal, too. Contrary to what some might wish, I expect a court would have no trouble deciding that both of these services -- TorrentSpy and my example -- were set up and exist mainly for the purpose of assisting in illegal conduct. As for the user logs, I think you have allowed your distaste for the current state of the copyright laws to cloud your reasoning. There are no privacy rights involved in this issue. When one procures the assistance of another in committing an illegal act, there is no right of privacy protecting that relationship. Everybody likes a bargain, and there is no bargain better than something for nothing. But let's not fool ourselves into thinking that something is legal just because we wish it so. EDITOR'S NOTE: I appreciate your legal perspective, but if you'd read more of my comments on file sharing, you'd see that I do not condone piracy. And I do maintain that it sets a bad precedent for search engines to give up data on their users. Just because someone is searching for "Pirates of the Caribbean" doesn't mean they intend to illegally download the movie. Consider what would happen if Google was forced to reveal all their search data. I find these Articles INTERESTING and EDUCATIONAL ! EDITOR'S NOTE: The date stamp is on every article. Look for it just above the "Prev Article" link. It is common for users to download completely free and legal ISOs of Linux distros through P2P, and in fact, that is becoming the preferred way of getting distros as it doesn't cost the distro makers anything. P2P isn't just about piracy--and I could bring a whole argument about intellectual property and piracy to the table, but will spare you. My second comment is concerning the MPAA hiring someone to commit a cybercrime--isn't it illegal to hack into someone else's computer? There have been enough people busted for it, but I guess if you are doing it to stop piracy, anything goes. I think the MPAA should be accessory to a felony. If the media industry want to quel piracy, all they have to do is offer cheap, quality digital downloads...there are several business models I can imagine which would increase their overall profits. Unfortunately they are firmly rooted in physical media and are unlikely to change.